Hey Folks, if you caught my last post, you will know that I have a new obsession - canning and preserving fruits and vegetables. Yep - I'm in love. I can't describe the deep sense of satisfaction I'm getting from seeing the fresh fruit (right off the tree and straight to my kitchen) in those little mason jars lined up on my counter. So much satisfaction that peeling, chopping and simmering is all I did with my spare time for the last four evenings. In 4 days I did 7 batches of jam, two batches of applesauce and a batch of relish. Plus an apple loaf, apple muffins, apple scones, apple pancakes, apple strudel, blueberry thumbprint cookies and sweet potato muffins. Plus I've been freezing vegetables for the winter. I've been in a bit of a obsessive haze. I'm like a pioneer woman desperate to get the pantry filled up before winter. Ya - I know - there's a Giant Tiger, Target and Safeway just down the street. No need to get crazy - we won't starve when the snow flies! But I get in obsessive mode once in a while and I go into overdrive. My adrenals probably won't be happy about this little pet project. But it has been seriously fun. I am loving it. It is kind of embarrassing. However, my friend (the only one who also does canning and who will remain anonymous) did say she likes to just go visit her cupboard full of jam and beets and beam affectionately at them. So I'm not alone? Right? And because I have been obsessively canning fruit and baking (and eating of course) I have no time left to do my Sunday week in Review. But I ran a little poll and most people want RECIPES anyway. So a recipe is what you will get. A good one. This fruit spread is SO EASY TO MAKE. Just because you haven't done anything like this before is no reason not to try it. I had no idea what I was doing 4 days ago. And last night I actually properly sealed my first batch of jam. And it had no sugar or chemicals in it. Place apples and rhubarb in a large sauce pan. Add water and lemon juice. Mix to combine. Cover with lid and once it reaches a low simmer cook over low/medium for about 8 minutes. Stirring frequently. Add sliced strawberries. Cook for an additional 10 minutes (or until fruits are fully softened), continuing to stir frequently. Add Truvia and Chia seeds and combine thoroughly. Remove from heat. Mash mixture to a desired consistency. I only half mashed it so it would still have some chunks of fruit. Place in glass jars. Keeps in fridge for about a week. 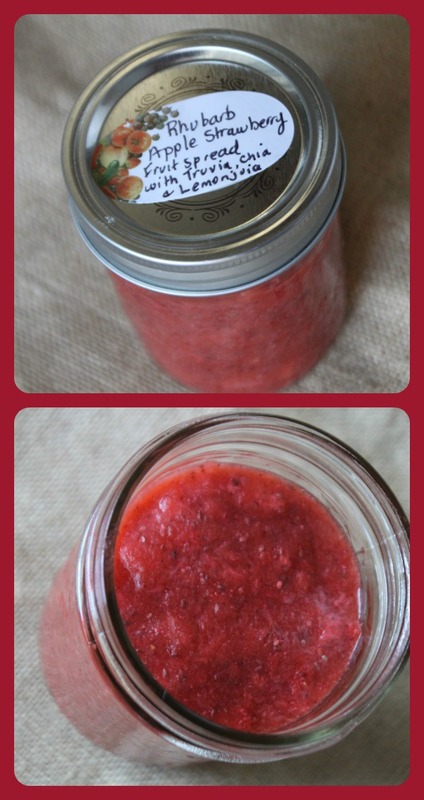 For freezer jam, leave about 1 inch of space at the top of jar for expansion. Should keep for 6 months at least. I did a batch with sealed jars as well. I warmed the jars in the oven (about 20 minutes at 200 degrees). I boiled the lids for 5 minutes. I placed the HOT jam in the hot jars. I wiped the rim of the jar to ensure they were clear and then I put the hot lid on the jar and tightened. I then let them sit. They all sealed. Yay!